Adelaide’s exclamation as she (re)folded the laundry. My lunch dates were twinsies again today! 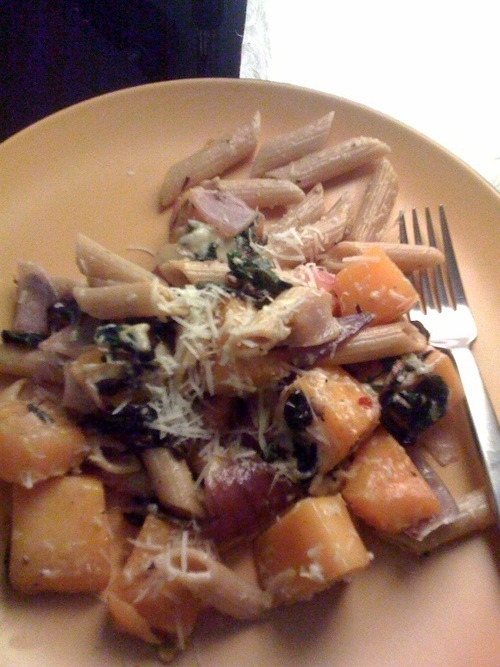 This is one of my favorite fall dinners, snagged from The Splendid Table on NPR. Last year, when I made this recipe for the first time, it came out perfectly! And I made so many mistakes! Unfortunately, after making it three other times, I haven’t been able to quite duplicate the glory of that first try. Next time I will use less pasta (3/4 lb. instead of 1 lb.) 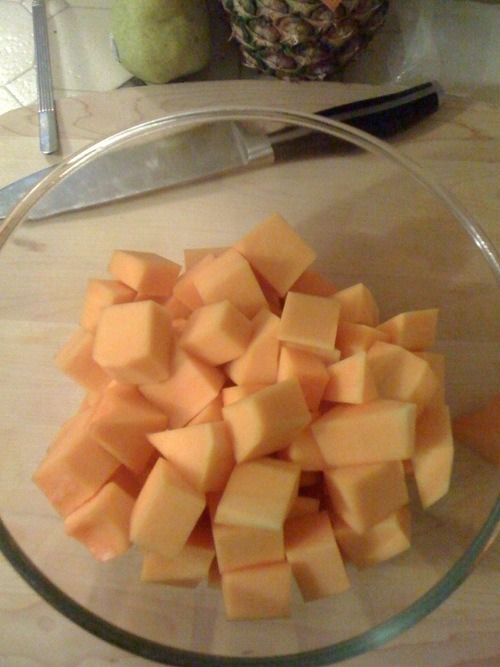 and a slightly smaller squash, cut into smaller pieces (1/2 to 1 inch instead of 1 to 1-1/2 inch squares). Besides the pasta and squash, be generous with everything else. I add an extra onion, use a whole bag of spring mix, extra red pepper flakes, oil, garlic, brown sugar, half-and-half, cheese… you get the idea. Cook to Cook: You could cook this dish ahead through Step 6 and then bake it in a shallow casserole, topping it with extra cheese in the last 5 minutes of baking. 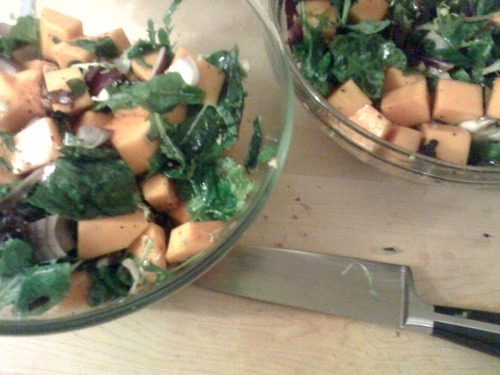 An autumn supper in a bowl, this is a “sauce” that you roast in the oven in about 30 minutes: chunks of sweet squash, roasted herbs, and greens. Add half-and-half, toss with hot pasta and cheese, and you have a great sell to the anti-vegetable contingent. 1. Slip one large or two smaller shallow sheet pans into the oven. Preheat the oven to 450 F. Bring the salted water to a boil. 2. In a big bowl, toss together all the ingredients for the roasted vegetables. Be generous with the salt and pepper. 3. Pull out the oven rack holding the sheet pan. Taking care not to burn yourself, turn the squash blend onto the hot sheet pan and spread it out. Bake for 25 minutes, or until the squash is tender, turning the vegetables two or three times during roasting. 4. As the squash becomes tender, drop the pasta into the boiling water and cook it until tender, but with some firmness to the bite. Drain in a colander. 5. 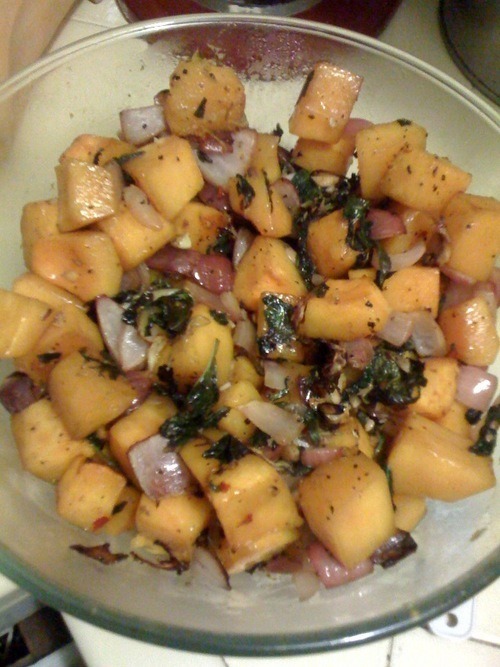 Once the squash is tender, turn on the broiler to caramelize it. Watch the vegetables closely, turning the pieces often. Anticipate about 5 minutes under the broiler. 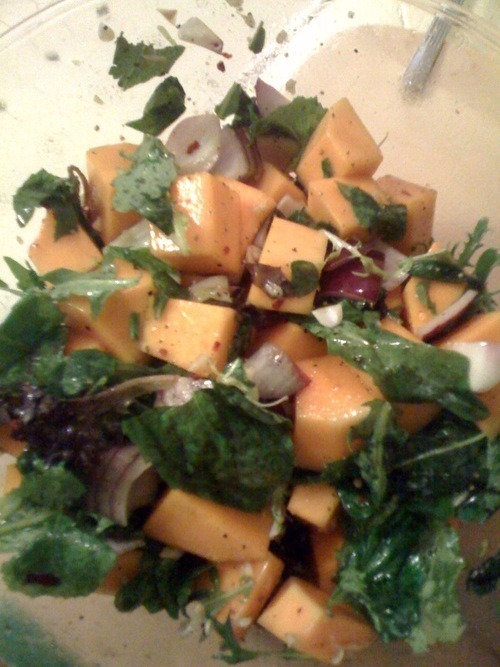 You want crusty brown edges on the squash and wilted, almost crisp greens. 6. Scrape everything into a serving bowl. Add the half-and-half, hot pasta, and 1 cup of the cheese. Toss to blend, tasting for salt and pepper. Add more cheese if desired. Serve hot. I kind of want to make these socks. 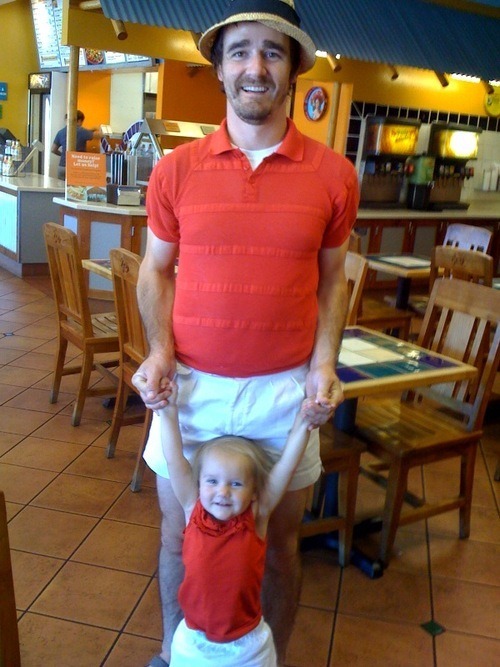 Daddy and Adelaide are twinsies today.